Just before Easter my email accounts disappeared out of Apple Mail, and I've yet to restore them. (Any ideas? They're all gmail accounts.) Which really bites as it was so easy to go from one account to the other and find what I needed to respond to, delete, etc. Okay so computer glitch. I can live with opening a browser and reading email that way, so not a major disaster. Then my phone went. People could hear me, but I couldn't hear them unless I put them on speaker. At least Apple replaced it, so one less problem to worry about as the worst was yet to come. Remember when I said how thrilled I was that I could finally wear contacts? Last week I managed to scratch my cornea, apparently quite badly. I've been at the doctor every day for a week, and if it doesn't heal, off I go to another specialist. I'm terrified. So if you have a spare prayer I sure could use it! I must say my husband has been taking such good care of me, I don't know if I could do it myself -- I have to use various drops every hour and get a 3-hour break during the night. So we're exhausted as well. Even Gwensday was the best nurse when my husband had something he couldn't get out of, and made sure I got those drops, even asking if I wanted food or drink (I can barely eat, I think its more depression over this whole thing rather than anything physical -- hey I can stand to lose a couple of pounds before bikini season!) I love my family so much, they're the best! A few weeks ago on FB I posted two pieces of furniture my great-grandfather made. My cousin was trying to clear out my aunt's apartment (she's had to be put in a nursing home) and I sobbed loudly (waking everyone in the house!) thinking it would go just anywhere. So even though I've no room, I took both pieces. I'll make room, selling pieces that don't mean anything to me! 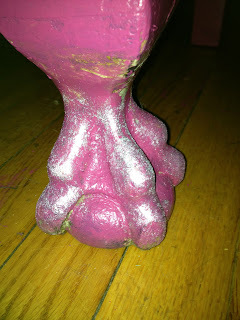 Here they are before paining and polishing. There is some interesting history that goes back to Naples, Italy around the time of the Industrial Revolution, another reason I couldn't bear to see the furniture go just anywhere. My great-great grandfather worked for King Umberto in the castle, carving and creating furniture. The king's son and my great-grandfather were best friends. I had heard that this particular king was known for bestowing titles on those he favoured. So he made my great-great grandfather a Count. My great-grandfather gave up his title to become an American citizen, had he not, the title would have been passed down through each generation, making me a Countessa! (When I had my indie lingerie line I named it "The Countess" in homage.) I always knew I should be royalty! Heehee! 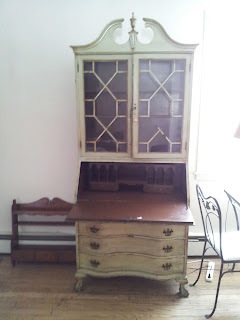 The secretary was in bad need of a paint job, and while I usually shudder at people who paint over old pieces, I could tell the wood underneath wouldn't be worth stripping. So the first colour that popped into my head was fuchsia (hey, why not go wild?) 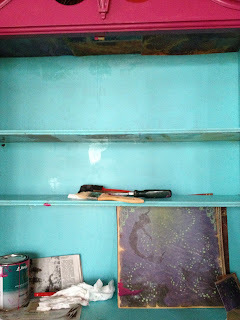 Then as I was painting it I kept thinking that if I painted the interior Tiffany Blue (like our bathroom) it would remind me of Marie Antoinette, and all those beautiful silks, not to mention macarons! So that's what I did, and as I was painting the interior it occurred to me that my great aunt (my great grandfather's daughter) was named Antoinette (and was born just down the street from my first shop locale on MacDougal St in Greenwich Village.) Then I realised this belonged to Antoinette's sister, my other great aunt who was born just a few blocks from my shop's second locale, also in Greenwich Village. So while I felt a bit odd painting over, I also felt I instinctively did the right thing. Like my family was giving me the okay. Besides, both Italian sides (who oddly both settled in Greenwich Village when they first came to the US) were artists, and as artists I know they would understand my decision as well as my vision. 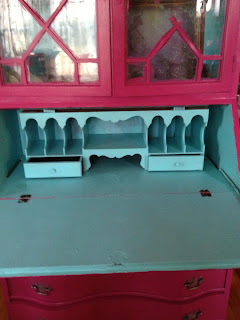 Second (and final) coat of fuchsia, and Tiffany blue inside. 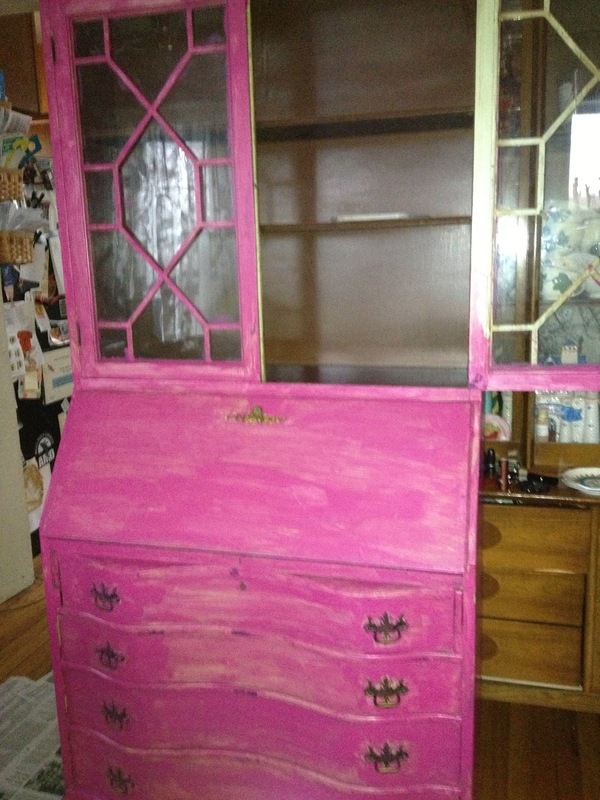 Inside the drop down desk. 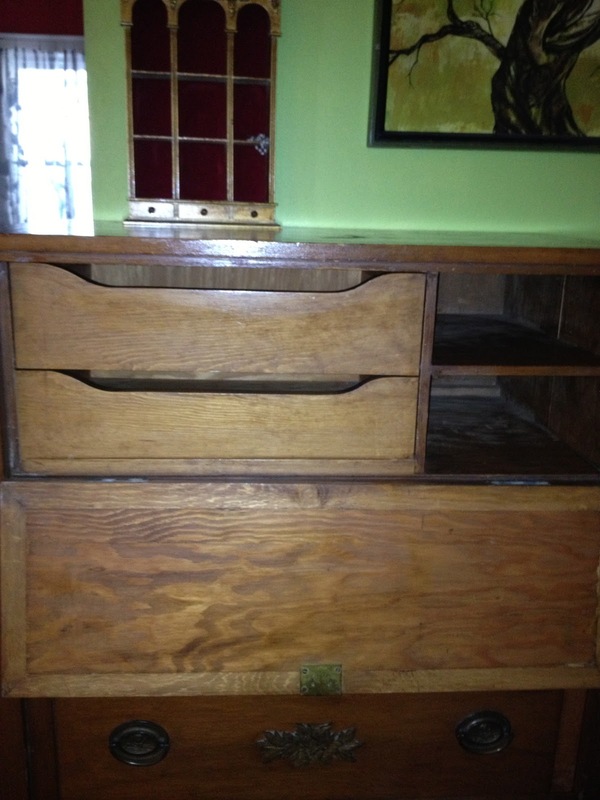 I've yet to line the little drawers or the drawers below. And as you can see from the other pics, I've still got some touching up to do. But I can probably put it in place by the end of the week! The interior of the upper part. Instead of painting the underside of the shelves I used some fairytale themed scrap booking paper. Very magical looking if you happen to look up! 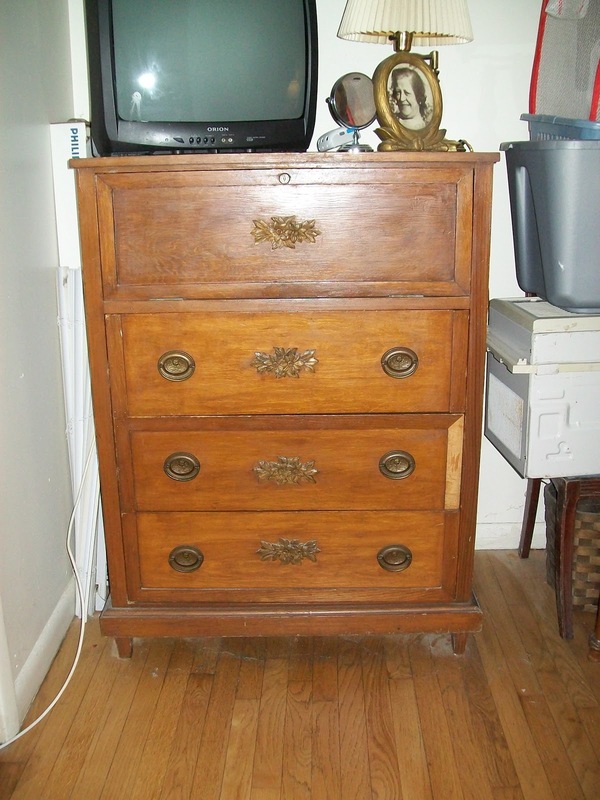 The chest of drawers original state. 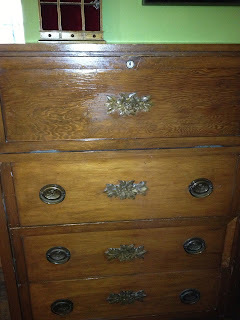 The chest of drawers, fairly well shined up -- was running out of wood oil! Interior of the chest of drawers. The top drops down, doesn't pull out like the drawers below. That little shadowbox to the left was also my aunt's. 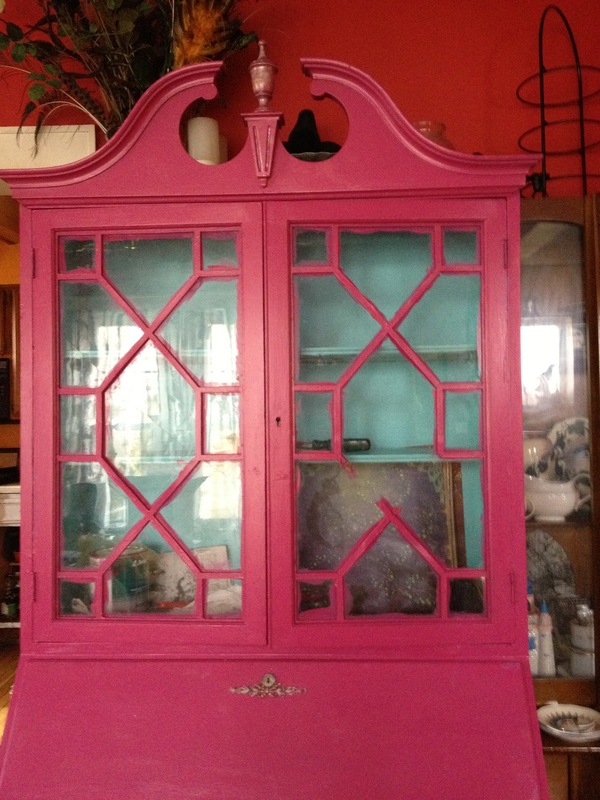 I have so many little things taking up space in our china cabinet, so it will get an overhaul and become a showpiece. 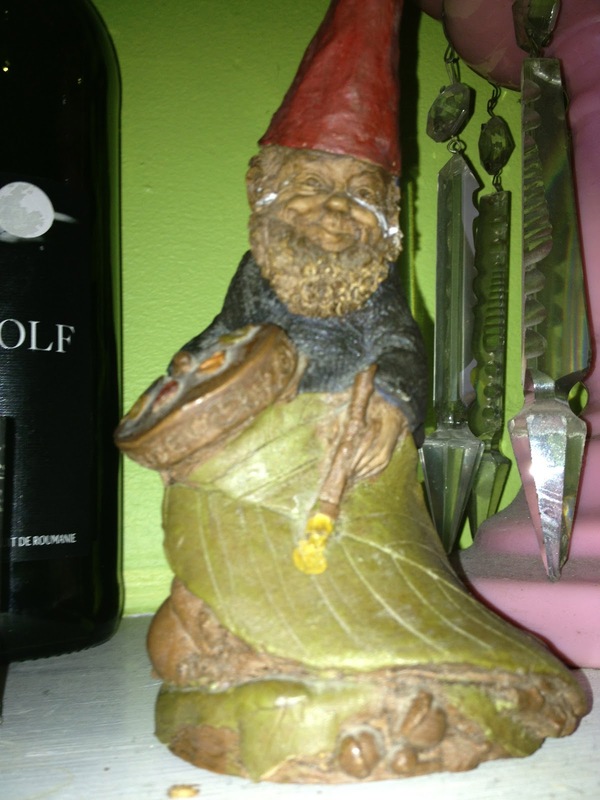 I was also gifted a little gnome figurine with an artist's palette and paintbrush at the ready, and one of my aunts faux fur coats that somehow fit (that side of the family were not teeny, they were mostly tall & willowy) so my cousin thought it had to go to me. I love having pieces belonging to family members, it always makes me think of happy times with them. I also came home with a few other tidbits like some cobalt blue pyrex custard cups & a few other decorative pieces. My husband found something quite interesting while dropping some pieces at the Goodwill, but I shan't speak of that now as it may have opened a hornet's nest. Perhaps when we know more I can write about it as its very interesting. 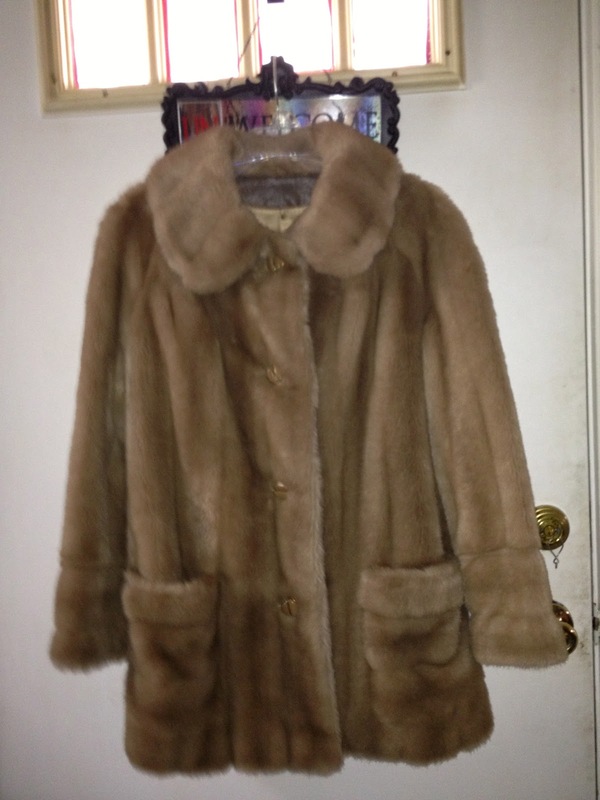 My aunt's faux fur, its actually a bit lighter in colour & fits a dream! Before Easter when Gwensday was on holiday she and I had a fun day having lunch with a treasured friend, then heading out to pick out new colours. They keep coming out with more and more, and have now got a "Mixer/Pastel-izer" (seriously guys, just use white conditioner, just as easy) to make the colour pastel. I was told only Chris Benz and myself had it thus far! Can't wait to play, just been nervous since I can't see out of my right eye too well and eyeglasses get in the way! Our new hair colours! On bottom l to r, Cleo Rose, New Rose, Mystic Heather (for Gwensday) and on top is the Pastel-izer. The pinks are much more vibrant, as is the Mystic Heather. Having pieces of my family history, the love and care of my family and friends was really the silver lining to these trying past few weeks. However, today at my doctor appointment, I got good news! She said it looks much better than Saturday when she saw me last, I can cut down on one of the drops so we can get a whole 4 hours sleep straight through, and was very hopeful it was healing nicely. Last night on Facebook, feeling sorry for myself, I asked for your prayers and positive energy if you could spare some, then today the good news -- I don't believe in coincidences. I have the love of my family and friends to thank for all the prayers and good vibes -- I can't thank you enough, as I know the power of prayer and positive energy and know you all had a hand in this! Please accept my humble thanks. One bad thing is that she didn't think I should wear contacts again, but I'll cross that bridge when I get to it as there may even be another type I can use that don't disintegrate or disappear so easily (seriously, I can see I've got it out to the white of my eye, then it disappears!) The odd thing is that I could see better with contacts than I can with eyeglasses, weird eh? The sun shone brightly today and it was 70 degrees! I noticed a few bunches of crocus and the leaves of my tulips and daffodils are up too. So maybe spring has finally arrived? I hope so! Have I missed anything fun? If it takes me awhile to get back to you --you know its still the Gmail import to Apple Mail driving me crazy! Oh amor I'm so happy you are healing much better. The secretary is looking fabulosa! Love those Manic Panic bright colors.I need an evil white streak on my hairl faux caot is gorgeous, need you to model it for us.Doesnt surprise me your a grand Contessa. What a terrible time you've had! So glad you're on the mend now! oh i already read it on Facebook that someone seems to cursed you :( well but i think he failed because you have so much people who love you and sending you positive vibes (count me in in that part;) that i´m sure you feel much much better soon. and i loved to read that story so you have blue blood in your veins, the countess of punk;) i knew it already before that you are special darling! and gosh i looooooove that coat of fuchsia!!!! 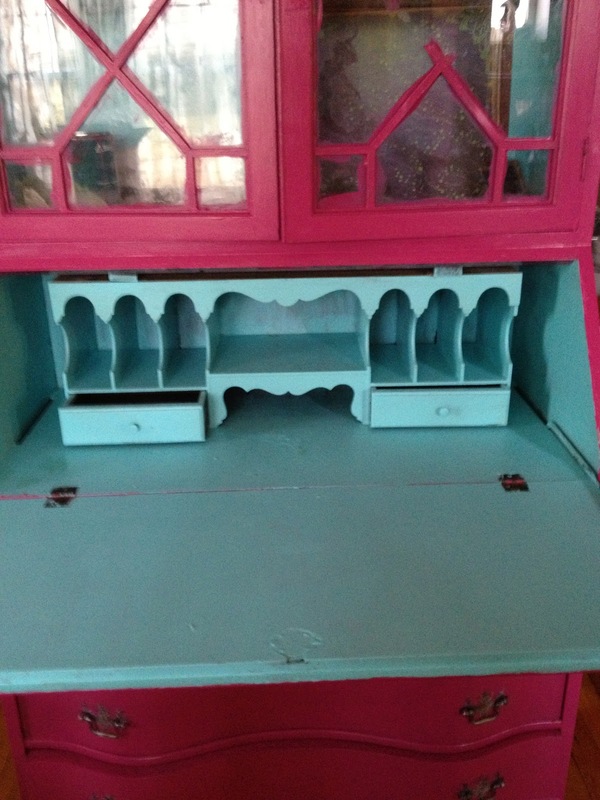 it looks freaking amazing against the tiffany blue inside!